Make sure you follow us on Twitter and look out for the #IntoDarkness to link in with the collective minds also watching. 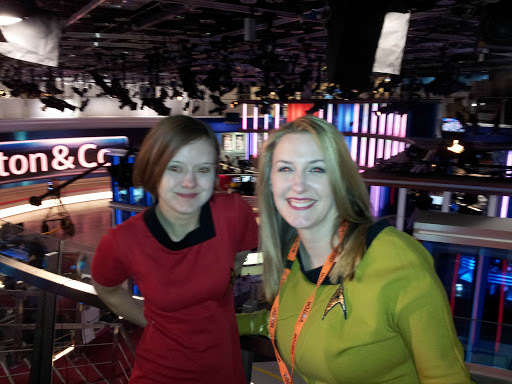 We came, we saw, we geeked out at Star Trek Into Darkness. This is our initial reaction from the cinema. As fresh as Gagh. Contains No Spoilers. After a night filled with dreams of explosions, miniskirts and lens flares we arrive back in London this morning for the Press Conference. You couldn't pick a better location, set against the backdrop of London, the very scene used in the movies posters (in our minds we see 23rd Century architecture too). Lidelof mentioned he wanted to stay true to the original Star Trek, to embrace canon but not be limited by it either. This was also reflected in Orci and Kurtzans responses. Exclusive Star Trek Into Darkness Gifts! Today is the the world premiere of Star Trek Into Darkness in London and to celebrate that and its release on 9 May, we have teamed up with Paramount Pictures to bring you a fabulous set of Limited Edition free goodies. We have been blown away by all the excitement and build up surrounding Star Trek Into Darkness and have been very lucky (or tortured) to have seen the first 30 minutes of the movie, but since the wave of Premieres began last week we have avoided all spoilers so we can sit back and enjoy the movie. Tomorrow (Weds 1st) we will be put out of our misery as we will see the film in its entirety! Don't worry, we won't say a word. Spoilers are out there if you want to find out. Star Trek: The Search for Scotty? If (like us) you are still determined that the prophets will shine down on you and grant you tickets to the London Star Trek Premiere, then here is another chance to win some with Paramount Pictures. 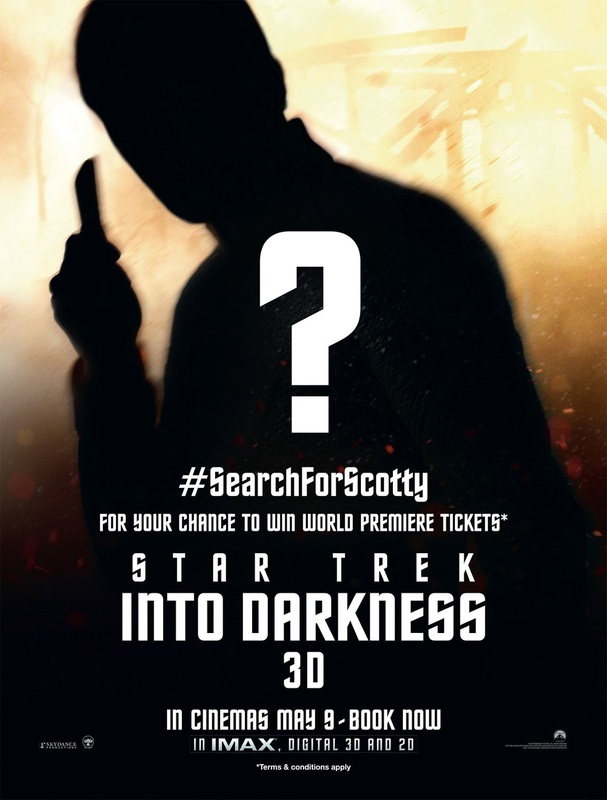 All you need to do, is look out for the Into Darkness posters jotted around the country (UK) and find the ones featuring Scotty! You jot down the code then enter the details with Paramount. Whenever we see a tweet declaring a 'new' trailer we have to do a little bit of studying to ascertain if it is new and different from the last one we saw. Not that we're complaining but we reckon if you shuffle all scenes from all trailers you can piece together the whole film now! This latest trailer looks incred! We are itching like a scabby tribble to see this film now. Is it our over active imaginations or do we spy an Excelsior class ship? We can almost see Sulu eyeing it up and mentally picking out paint samples. 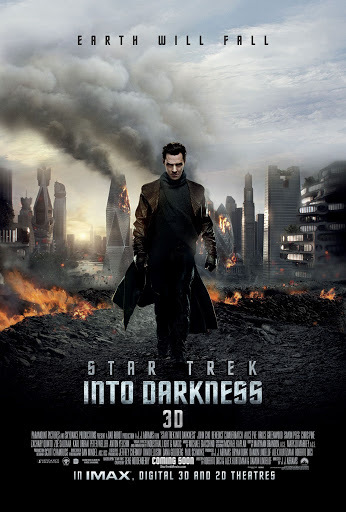 Star Trek Into Darkness UK Cinema Tickets on Sale! Just like how touching the Pheonix made it more real for Picard. Being able to purchase tickets to Star Trek Into Darkness makes it ohhh so real. So a thorough coverage and selection to choose from. These can be purchased through the official Paramount Star Trek Into Darkness site here. Not all locations showtimes seem to be available yet. But for our local cinema (Portsmouth) it allowed us to click through to Vue's website and purchase tickets. Can't help but notice the Wednesday 8th May 00.05 screening hailing us!